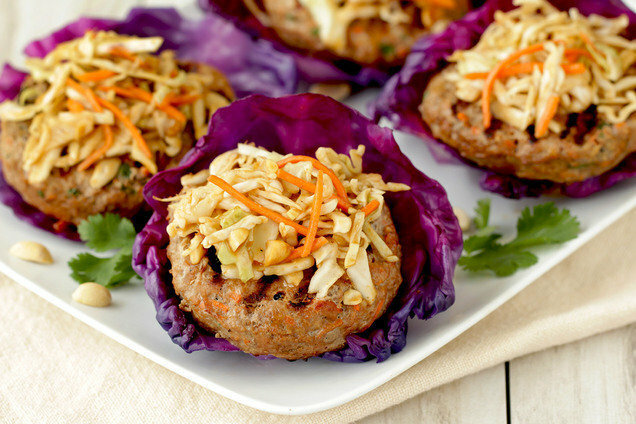 Flavorful patties topped with peanutty slaw... This recipe is a game-changer! In a medium bowl combine all slaw ingredients. Mix well, and refrigerate until ready to serve. Bring a grill sprayed with nonstick spray to medium-high heat. Grill patties for 5 minutes with the grill cover down. Flip patties. With the grill cover down, grill for 5 more minutes, or until cooked through. 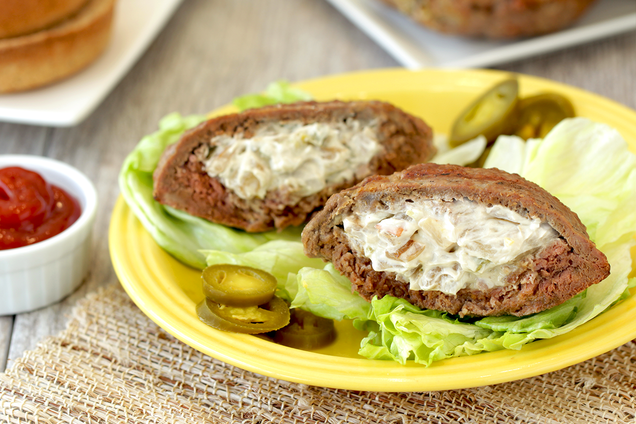 If you love the combination of hot peppers and creamy cheese, you need these decadent stuffed burgers in your life! Bring a skillet sprayed with nonstick spray to medium-high heat. Cook and stir onion until softened and browned, about 5 minutes. Transfer to a medium bowl. Add cream cheese, chopped jalapeño peppers, 1/8 tsp. garlic powder, and 1/8 tsp. onion powder. Mix until uniform. In a large bowl, thoroughly mix all remaining ingredients, including remaining 1/2 tsp. garlic powder, and remaining 1/2 tsp. onion powder. Divide into four portions. Divide one portion in half, and flatten each half into a thin patty. Place 1/4th of cream cheese mixture (about 3 tbsp.) in the center of one patty. Top with the other patty, and squeeze edges to seal, forming one stuffed patty. Repeat to make 3 more stuffed patties. Bring a grill sprayed with nonstick spray to medium-high heat. Grill patties for 4 minutes with the grill cover down. Flip patties. With the grill cover down, grill for 4 more minutes, or until cooked to your preference. Hungry for More Healthy Burgers? May 25th (today) is National Wine Day! If you’re looking for reduced-calorie wine with fewer carbs and less sugar, look no further than FitVine! Click "Send to a Friend," and get the party planning underway!